If you find yourself humming songs in the grocery store that go a little something like, “Yummy, yummy, yummy, I’ve got love in my tummy and I feel like alovin’ you,” then this is the fruit for you! Now let me tell you about these little yummies. Wandering through my favorite farmer’s market this Sunday, I ran across these plums and was shocked to see them available. It is most definitely not stone fruit season here in Southern California. But I had just been surprised at the stand next door by finding fresh Christmas figs (it is also not traditionally fig season – post to come later this week), so I figured it was just a crazy day and I should start asking questions. A quick chat with one of the ladies, who I believe may have been the founder of the farm, Annie, told me that the season for these did in fact end late October, but they have been keeping them cold and they still taste fantastic. Only a week or two left of their stash! I’m so glad I stopped by. 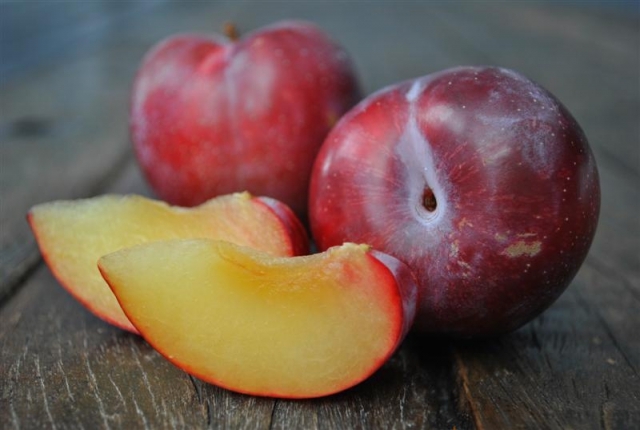 This is a rather large plum, more the size of a small apple with shiny burgundy, speckled skin and golden yellow flesh with a pretty red outline. Firm and a bit crunchy with a nice amount of juice. Well rounded flavor that is nice and sweet with a hint of tart at the end. With a word like yummy in the title, this fruit had a lot to live up to and I would say it did. I tend to favor the softer plums, but this crunchy little number is, well, yummy. It has the perfect amount of sweetness without being cloying and finishes up with a tart little twist – never bitter like many of the plums and pluots tend to be. Delightful.